The Consumerisation of Enterprise Mobility: Yes, a Formidable Challenge for CIOs, but also a Great Opportunity. As more and more consumers invest in smartphones, tablets, and other web-enabled mobile devices, enterprises of all sizes are being confronted and challenged by employees who want to use these same devices for full access to their professional lives, in addition to their personal ones. This trend, the “consumerisation” of enterprise mobility, represents a formidable challenge as well as a great opportunity for organisations. When coupled with the growing availability of high-speed Wi-Fi, cloud-based services, and virtual technologies, these mobile devices can easily support a flexible business environment, fostering the ability for working anytime, anywhere.The distinction between business and leisure time is no longer dictated by a traditional 8-to-5 schedule. On a personal device, employees can transition between business and personal tasks seamlessly, allowing them to work when they’re most motivated. In a survey by VansonBourne:78 percent of CIOs don’t know what devices are connected to the corporate network, and 77 percent of enterprises don’t know what data is lurking on all of those devices. Consumerisation offers organizations great potential for increasing individual productivity and reducing overall information technology costs. However, it also creates security risks, potential financial exposure, and increased operational headaches for organizations. 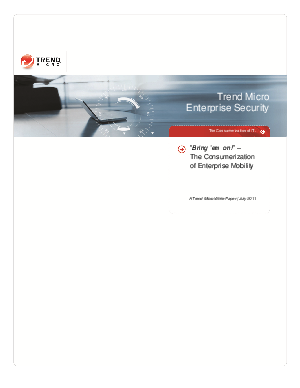 Download Trend Micro Enterprise Security Whitepaper: The Consumerisation of Enterprise Mobility to learn the secrets to data protection on mobile devices.